Who Has My Data, and Who I Trust With It – Sanspoint. In an ideal world, I wouldn’t have to trust my data to a third party. I could simply plug a box into my home Internet connection, and trust that my digital life would live there while being accessible on any other device I own. It would hold everything from email to personal files, from photos to music, from my health data to my identification credentials. It would be 100% reliable, secure, encrypted, and accessible only to me—and maybe my partner. And, as long as I’m living in a fantasy world, it would cost a nickel, use no power, and come with a free pony. So, I’m stuck offloading my personal data to an assortment of companies with varying degrees of reliability and trustworthiness. 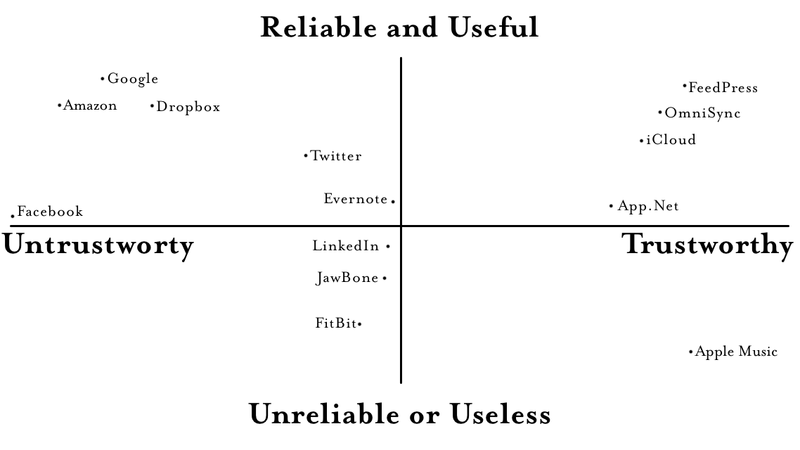 The chart below helps break down where several of the services I use—or used to use—fall. The services in the bottom left corner are ones I’ve stopped using, save for LinkedIn. Jawbone and FitBit are flaky services that silo my data. LinkedIn is just frustrating and annoying. There is only one service in the bottom left corner, which will surprise no one, because no matter how much I can trust something, I will not use it if it is unreliable. I conflate reliability and utility, mostly because three-dimensional charts are terrible, and also because unreliable services are generally useless anyway. Reliability is a huge factor—will I open an app to find that all my pictures, files, music, what-have-you is exactly where I left it? Will the changes I made on one device propagate to all the others without errors or data loss? This is a hard problem to solve, and nobody’s gotten it completely for everything. The more complex the data set, the bigger the problem is to solve. Google seems to have a lock on this, along with Dropbox. iCloud is getting there, but has its share of weird issues that are slowly being ironed out. We’re not hurting for Internet services that fail to deliver on their promises in terms of having our data everywhere. There’s another factor we need to consider. That factor is Trustworthiness. Trust is a question of data security–not just against malicious actors, but also how the company will be using that data. Let’s go back to Google. Though I’ve had nothing but bad luck with Google Now, I like the idea in theory. I had high hopes for the new “Proactive” features in iOS 9, but they’ve been largely a non-entity for me. If Google was just going to be using the data I feed it to better my life, I’d have put them on the other side of the chart. Instead, Google sells my data—supposedly anonymized, chopped up, and in bulk—to advertisers. That’s a violation of trust. In all other respects, Google is a solid steward of my data. They’ve had data leaks and security breaches, but no more so than most other companies in this space. I’ve also never run into synchronization issues or data loss with Google. iCloud loses a few points on reliability, but makes up for it immensely in trust. Apple’s commitment to privacy has me more willing to use their services for my personal data than any other, even if I’ve run into a handful of issues with synchronization. It’s a choice based on principles, and I’ll take a handful of frustrations with the knowledge that my data is safe, over knowing my data belongs to people who I didn’t explicitly authorize access to. One day, I hope I can have all the services I choose to use in the top right corner of this chart. I want to trust that my data stays safe, stays mine, and is not sold to the highest bidder. It’s not going to be an easy battle, since it’s more lucrative for companies to sell data and keep the services free. Data is the currency of the Internet. We’ll probably never be free from trading data for services, but I can hope that one day we’ll have more options on how much of our data to spend. Until then, I’ll keep holding out hope for the free pony.